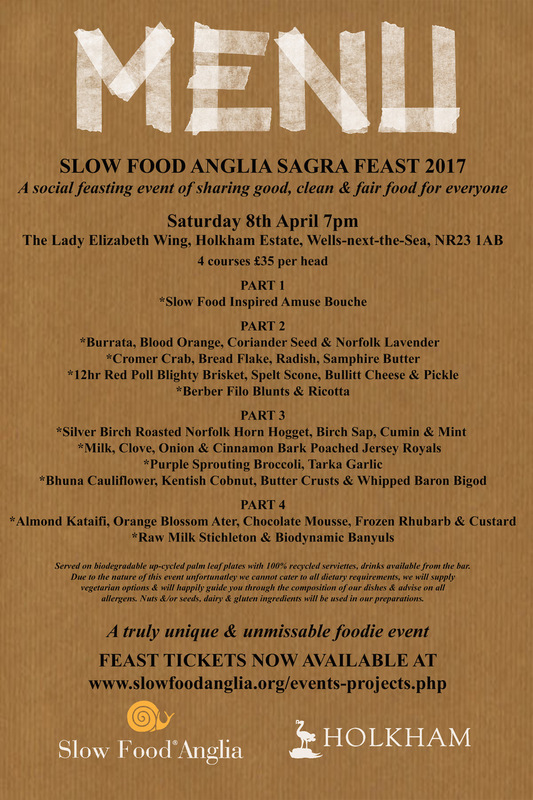 Slow Food Anglia is very pleased to be holding their first festival andSagra at the historic Holkham Hall Estate, home of the Coke family and the Earls of Leicester located on the beautiful North Norfolk coast. We will be holding the Sagra at Holkham Hall along with the well known Norfolk based Bullitt Dining who are our partners for this prestigious and exciting event on Saturday 8th April 2017 in the newly refurbished Lady Elizabeth Wing on the estate. A Sagra is an Italian festival, normally dedicated to a specific local food, often specific to that village, town or particular area of an Italian region, and it normally will be a celebration of a specific food such as olive oil, meat, fish, pasta and other local produce. During the Saturday there will be twenty two local East Anglian food producers present inside the venue with another six local street food vendors from Norfolk and Suffolk located outside in the large courtyard. Want to get an idea of what a Sagra is? Click HERE to see some pics of the one we held in Norwich last summer! A day market from 10 am until 5 pm with 22 small local producers from the East Anglia region with particular focus on Norfolk ones. There will also be street food stand outside the main entrance in the garden. Producers will be selected on the base of Slow Food principles of good, clean and fair and we aim to have a vast range of different producers representing the whole Anglia Region. During the day there will also be cookery demo and free tasting on a dedicated area of the Market. Entrance is FREE but there will be a £3 car parking charge from Holkham. In the evening starting from 7 pm there will be an Italian Sagra Style dinner featuring lots of the producers that will attend the market on the day and many of the Slow Food Ark of Taste products for the East Anglia Region. You will need to buy a ticket to attend the evening Sagra style dinner that will start at 7 pm. Price is £35 per person for an incredible four course menu. Drinks are NOT included but you will be able to purchase them separately at the bar either by the glass or bottle during the day and evening. There will be a choice between red, white and fizzy Italian organic wines and local ciders and beers from a local brewery. Slow Food Members will also get a £5 voucher when buying their tickets to be spent at the bar. The menu will be prepared by Chef Mark Matless who has recently joined the Slow Food Chef Alliance and becoming the first Slow Food Chef Alliance member for the Anglia region. His catering company, Bite the Bullit, has been a supporter and member of our Slow Food Anglia Approved Business Scheme for several years. Mark will prepare a menu specifically dedicated to products from the Anglian region, such as Norfolk Horn lamb from Cambridgeshire, Baron Bigod cheese from Fen Farm Diary in Suffolk, and more produce coming from small local East Anglian producers. There will be 25 Sagra meal tickets available for purchase on the day, payable only by cash or cheque. So please book in advance to save disappointment! Slow Food is a Not For Profit organisation so where possible we ask you to please pay by BACS rather than PayPal. Have a look at the list of producers coming HERE! 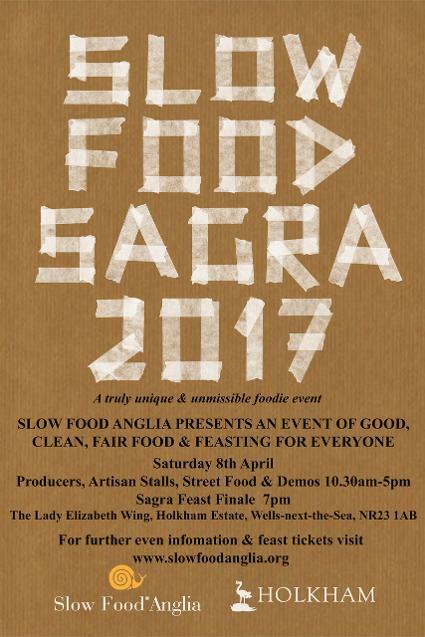 Slow Food Anglia is looking for enthusiastic, local business who share our same values about good clean and fair food and what to join us for a day of celebration of the Slow Food principles on Saturday the 8th of April 2017. On the day of the market we will have space for 20 stands inside the Hall and up to 6 street food stands outside in the courtyard. The venue comes fully equipped with electricity and water included in the price and no VAT. Traders can set up early morning on the day or the previous evening as there will be security in place overnight and there are CCTV cameras inside and outside the venue. Slow Food Anglia Approved Business members will get usual benefits as discount on trade fee. The festival and market will be from 10 am until 5 pm and then the Sagra feast will start from 7 pm and our Slow Food Chef Alliance chef Mark Matless will present a great 4 course meal for 200 people. All the producers and traders present during the day are welcome to join the event too and Mark is also looking for producers that would like to have their products featured as part of the evening menu in addition to being present during the day. We will have a dedicated section on the menu listed local producers and in particular the ones that are on the Slow Food Ark of Taste or Presidia. Download HERE the form to participate and send it back to us together with a copy of your payment. All producer and trader places are now reserved.